Your pet's wellness is very important to us. Emergencies are seen during hours of operation. Please call ahead, if possible, then proceed directly to our hospital. of the veterinary emergency clinics below. Below are some common pet emergencies. 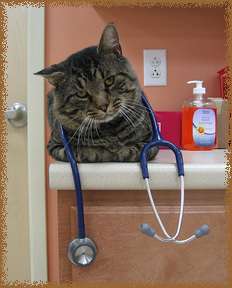 have your pet examined by a veterinarian IMMEDIATELY! Increased respirations, labored breathing, wheezing, or bluish/ purple gums are all signs of respiratory distress and poor oxygenation. Cats typcially do not pant unless they are stressed, such as a quick trip to the vet. If your cat is panting at home it should be examined by a veterinarian immediately. Commonly seen in cats that have a blood clot and can be a sign of heart disease. This is a very PAINFUL, stressful event. Commonly seen in large breed, deep chested dogs, these signs can indicate Gastric Dilatation and Volvulous (GDV), a life-threatening condition that usually requires emergency surgery. The abdomen is sometimes distended but not always. Most often seen in male cats, but can be seen in dogs, female cats, rabbits and guinea pigs - both male and female. This may indicate a urinary obstruction. Sometimes serious injuries cannot be seen on the outside. If your pet has suffered a traumatic event, such as being hit by a vehicle, it should be examined immediately. Sometimes they can appear normal but could have internal injuries. Never let the sun set on a bad eye! Eye conditions can deteriorate quickly and the eye is densely innervated so it is often very painful if something is wrong with it. Bite wounds from other domestic or wild animals may be more severe than they appear initially and usually get worse before they get better. Bite wounds tend to get infected quickly. Any type of bleeding, especially prolonged bleeding. Vomiting can be a sign of many different things. Pets can become dehydrated quickly so they should be examined by a veterinarian sooner than later. Chocolate, prescription and over the counter drugs, glues and adhesives, antifreeze, houseplants, and sugar free chewing gum are just a few of the household items that can be dangerous for your pet to ingest. If you are unsure if the substance your pet came in contact with is toxic, please contact the ASPCA Animal Poison Control Center immediately at (888) 426-4435. If you pet has a seizure lasting longer than five minutes or more than two seizures in a 24 hour period. Not eating, lethargy, collapse, "not acting right", burns, heat stroke, near drowning. This is only a list of common emergencies. If you are unsure if your pet is having an emergency, do not hesitate to call a veterinarian. If you are concerned, then it is an emergency!